In the grand scheme of things, sitting on a plane for a long time is quite a strange thing to do. Air travel’s a very recent development in the big scale of human history. So are cars, thick-wedged shoes and everything else that doesn’t belong in The Jungle Book. Jet lag isn’t a badge of honour, it’s a serious modern problem that can affect everything from weight gain to bipolar disorder. But it’s also a reality of modern life. It might be worth learning how to handle it, and without relying on sleeping pills. To tackle the problem, we can understand it by trying out a new word: desynchronosis. Desynchronosis is the medical term for jet lag. It means that your circadian rhythm – your body clock – is out of sync. Your body thinks it’s still in one time zone, but it’s physically somewhere else. So it gets confused, tired and stupid. 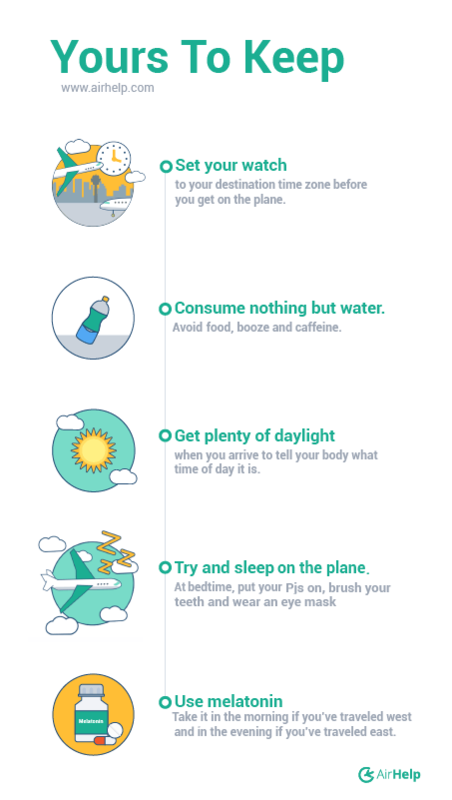 The best way to beat jet lag is to quickly and clearly give your body the information it needs about the new time zone. In short, your body needs a good amount of sleep and sunlight and at the right times. This starts not when you land, but before you take off, by setting your watch to your destination time zone as you settle in for the journey. Our circadian rhythms evolved to be linked to the solar day, which means our internal clock can be easily influenced by quantities and timings of daylight. Experienced air travellers know that flying east across time zones is harder than flying west, because traveling east shortens the days while traveling west lengthens them. It means your circadian rhythm needs to do more to catch up. Melatonin is a hormone that tells your brain when it’s time to wind down and go to sleep. Taking a small amount, between three to five milligrams, 30 minutes before you want to go to sleep, can really help your body clock. Taking it in the morning tricks your brain into believing you slept longer. But be careful, says Lugavere, because “this naturally-produced hormone is easily suppressed by bright light, so I try to minimise my exposure to glaring screens for at least an hour before bed.” Sorry, Spider-Man. You can’t binge on back-to-back Marvel movies on the in-flight entertainment if you want quality shut eye. Airplane food is fun. It comes in lots of little boxes and wrappers, each one its own little puzzle to solve. It’s also astonishingly bad for you, high in quick carbohydrates, overly processed oils and mysterious additives that will make you feel rough. Lots of jet lag experts never touch the stuff. Lugavere has protocols for both the morning and evening when he needs to get his body clock back in check. “Taking a shower on the coldest setting could theoretically trigger a hormone response akin to what normally occurs waking up – helping to put you back on track. I do this regularly and when I’m fatigued the cold makes my brain feel like it’s coming back “online.” In the evening, Lugavere recommends turning the air conditioner down, then taking a warm bath or shower. “Stepping out into the cooler room tricks the body into a sleepier state,” he says. Neuroon. The world’s first smart sleep mask. The GloToSleep Mask. Uses gently dimming light to help you fall asleep. SeatGuru App. Lets you avoid seats in galleys, near washrooms and at the back of a plane, which are bumpier. The British Airways Digital Pill. It’s coming. Jet lag is partly a result of dehydration (loss of body water and electrolytes like sodium). This dehydration starts on your airplane voyage. As airplane cabins are commonly pressurised to 6900ft above sea level, this already puts most people in deficit and they don’t even realise it. To mitigate this, drink water early and often. Carry a squirt bottle or cup of water with you always to remind yourself to drink. My favourite tip for sleeping well on an airplane is to spray rose water or a fruit extract mist on my face after I brush my teeth in the bathroom. My go to is the Tony Moly Pocket Bunny Spray or Reviva’s rosewater spray (you can find the rosewater spray at almost any Vitamin Shoppe or make your own version at home). The spray keeps my skin hydrated without making it feel greasy the way some lotions do, plus the light scent is quite soothing. My tip is to buy the flight tickets in a way that I arrive at the new destination in the evening. Like this, I am able to fall asleep very quickly, have a good rest, and then to wake up in the morning according to the local time. Begin to adjust your child’s nap hours and bedtime in the week before travel. While you probably can’t move entirely to your destination time zone at home, you can nudge your baby’s schedule in that direction. Almost everywhere I go I will exercise as soon as I arrive. Not the normal powerlifting I do, but a decent workout to get the metabolism running back to speed. Travel for me has never been an excuse to skip the gym. In fact I once did a workout on the roof deck of the Virgin Clubhouse in London, using my suitcase as a weight. Try deep breathing exercises. Air travel is associated with a drop in blood oxygen levels due to low cabin pressure. This can definitely leave you feeling out of it. Try deep breathing exercises to bring you back to centre. So there you go, folks, hopefully the only article on jet lag you will ever need. This advice boils down to these essential tips. Take a screen shot and share them with your friends. Flight delays happen, but that doesn’t mean you have to accept them. You may be entitled to as much as £530 in compensation if your flight was delayed, cancelled or overbooked within the last three years.